Blackwood Country Gates in Victoria creates a wide range of beautiful, durable wooden gates including farm, Tudor and garden gates that will make a statement on your property for years. 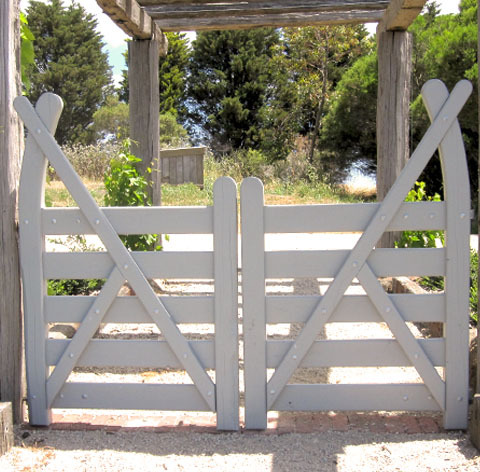 From driveway gates to country gates and wooden garden gates, our custom-made products from recycled or new timber will add a rich flavour to your home, garden or paddock. Gates aren’t just a hinged barrier you can swing open and closed. Not to us. They, and their associated gate hardware and hinges, are our passion. We put consideration, care and high-quality craftsmanship into all timber gates we build from our base on the beautiful Bellarine Peninsula. That’s the way we work. Every time. People have been using gates for thousands of years. Once a vital part of defensive wall structures protecting towns from attacking forces, they remain important in our everyday lives. 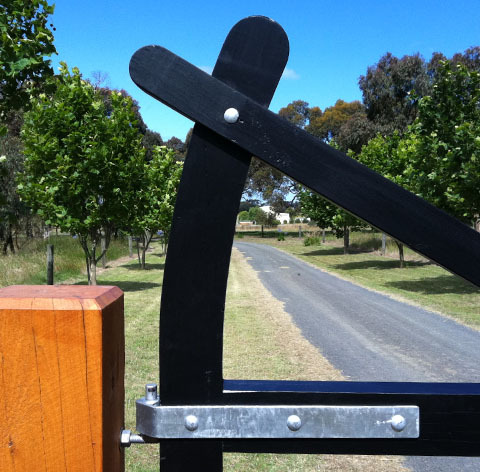 Nowadays we can use a strong steel gate to secure our properties, a small wooden gate to keep the chooks from the vegetable patch or the dog in the yard and a no-nonsense farm gate to make sure the sheep stay in the paddock. While gates are built for a practical purpose, at Blackwood Country Gates we marry that function with a sense of style and craft wooden and steel gates that inspire the senses. There’s something about quality wood that commands attention. It has a timeless character and warmth that evokes emotion and a sense of history. And that comes across in our tailor-made gates. They fit into the landscape like they’ve been there forever. At Blackwood Country Gates, we love designing and building wooden gates of all styles and sizes and their accompanying hinges. It never loses its appeal. And when we complete a project for a customer out of beautiful timber, we know it will stand the test of time. Contact us to find out more about our creations including fences.